I made this Cheech portrait when my wife Nini was out of town. Cheecher is lonesome without Nini, and I think this photo captures his emotion beautifully. He is really her dog more than he is mine. We’re both missing her and she’s missing us. But at least she’ll have a new Cheech portrait to enjoy. 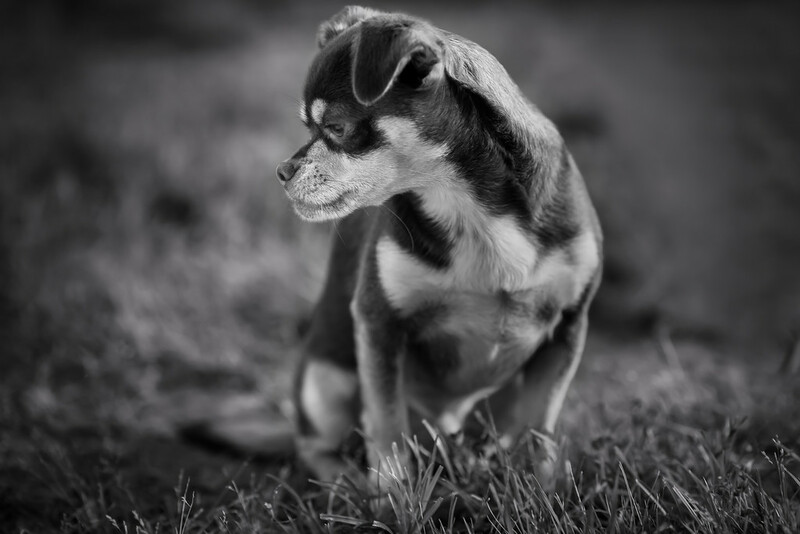 I grabbed my 135mm lens and a piece of white carboard for a reflector and set out to make some dog portraits. I propped the cardboard up on a rubbermade tub and coaxed Cheech into position so that he was facing the reflector, and you can see a little bit of it in the top of his eye. I made all three dogs pose, but Cheech was the best behaved, so he got better looking portraits. I processed the photo in LR4, then Photoshop, and then LR4 again. I used LR4 for the black and white conversion and exposure, and then used Photoshop to remove some unwanted things and to fine-tune the exposure, then back in LR4 I increased the clarity and the highlights just a touch before exporting to jpg.